Is GetApk Market application trustful? Is "GetApk Market" application trustful or malicious? Will it affect one's smartphone or tablet? Can anyone please help me out by confirming that, is it malicious for the tablet or not? Should I install it on the tablet? GetAPK seems to specialize in warez. It takes pride in hosting paid Apps from Play Store for free. Putting aside the blatant violation of intellectual property rights for the moment, paid Apps for free are infamously known to infiltrate the user's device as a malware. It would be unwise to proceed installing such app even if Virustotal doesn't show anything suspicious. However, curiosity sometimes cannot be put to rest, so if you want to test this app, I suggest you try it in a virtual machine in a PC using Android-x86 or the likes of it. You can also use a disposable Android device and see how well the app is behaving. Even than, that could only increase your confidence slightly. The risk would always linger as long as you continue to use such an app. In short, if you plan to install paid Apps for free whether directly or via a market, be prepared to have your data (assume everything that rests or is loaded in the phone) misused and taken hostage. Not the answer you're looking for? Browse other questions tagged applications malware alternative-markets or ask your own question. Why do apps legitimately purchased from Android Market warn about missing license? 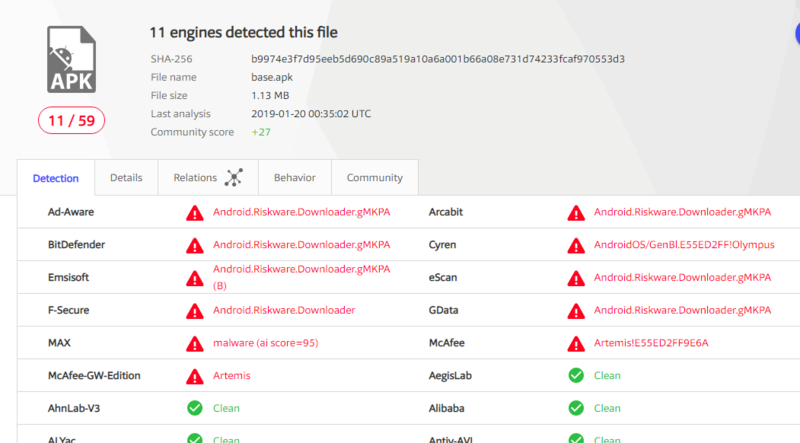 How do Antivirus for Android detects a Malware application? How to remove or disable pop-up alert()/confirm() box from build-in Browser from malware? How to report potential abuse in Aptoide without becoming a member?